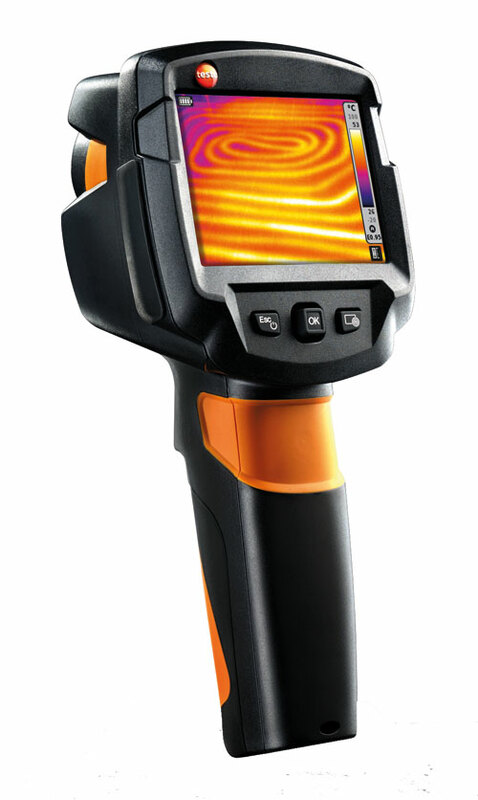 Testo 870 thermal imagers- Point. Shoot. Done. Sparta, NJ (November 1, 2013) – Testo Thermal Imaging is proud to announce the market launch of their next generation thermal imagers, the testo 870 series. “This series will be available in two distinct model offerings, said Kevin Lesnewski, Product Manager Thermal Imaging, which will offer sharp, crisp, detailed commercial quality images every time right out of the box”. The 870 series is built around the widest lens (34º x 26º) available from Testo in a point and shoot imager and the FPA operates at a 160 x 120 resolution or 19,200 pixels, which is upgradeable to 320 x 240 (76,800 pixels) with the Testo SuperResolution option. “Although the imager is small in size it is still packed with valuable features, said Kevin, features like automatic and precision manual scale control, internal storage of 2000 images and easy 1-button control as well as higher standard temperature detection range.” The Testo 870 imager series is a technologically advanced, well thought-out thermal imaging solution for Commercial Contractors, Facility Managers, and Energy Auditors, balancing many sought-after features and imaging performance in an easy to use small compact design. The new Testo 870 series allows for the easy and safe thermal inspections in many thermography applications: The thermal images are displayed in real time on a large 3.5″ LCD view screen which is 36% larger than some imagers available today. Critical center temperature and automatic hot & cold spot detection is a valuable standard feature of Testo imagers, which can be displayed directly on the view screen as well. Detailed image analyses and reports can be performed easily and reliably on any windows PC using the IRSoft analysis software supplied with every imager. The new testo 870 series of imagers is soon to be the first choice of many professionals who are looking for a reliable and quality thermal imager solution. Weight – 550 g/ 1.2 lbs. Testo AG, whose headquarters are in the Upper Black Forest, Germany is one of the leading producers of portable and stationary measurement technology worldwide. The high-tech company offers measurement solutions for, among other things, climate and environmental technology, industrial applications, emission measurement and the monitoring of food quality, and the building trade. The firm invests roughly 10 percent of its annual turnover in Research and Development, making an above-average commitment to future-oriented technology. With 31 subsidiary companies and over 80 distribution partners, the company is represented all over the world, and has a worldwide staff of roughly 2300.